Antonio Rodrigo 'Minotauro' Nogueira is hoping for a spring return against Roy Nelson. Anderson Silva’s fight team runs deep, about 15 of them all wearing matching white track jackets with Silva’s Muay Thai college logo on the back. 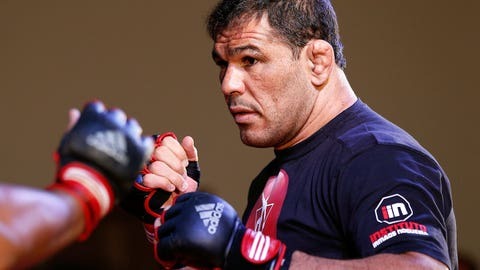 Among the traveling crew was the one he sees as his mentor, heavyweight great Antonio Rodrigo Nogueira. Last time we saw him, Nogueira was in the vice of Fabricio Werdum’s armbar submission, one that damaged "Big Nog’s" left arm. The injury, torn ligaments, would require surgery, and he’s been on the mend ever since. Nearing six months on the sidelines, he can finally see a return in sight. Nogueira told FOX Sports on Thursday that he hopes to return to action in April or May. I don’t feel pain, but it gets swollen, so I don’t want to be pushing 100 percent right now. "My arm is still a little bit swollen from the last injury," he said. "I’m training but I’m not 100 percent. I’ve started doing my physical work and getting in better shape for next year." The 37-year-old previously voiced a hope to fight Roy Nelson in his return. Nelson does not have his next match scheduled, but it’s unclear whether the UFC is interested in the fight. In fact, much of Nogueira’s future is uncertain based upon his recent inconsistencies. After never being finished in his first 36 pro fights, he’s been stopped in each of his last four losses, and is just 3-4 in his last seven bouts. Injuries have also taken a toll, as he was only able to fight one time apiece in each of the last three years. Faced with a potential career crossroads, Nogueira is taking his time to ensure that he doesn’t return prematurely. Almost six months after his surgery, he’s anxious to continue his forward progress, but not at the risk of any setback. "I don’t feel pain, but it gets swollen, so I don’t want to be pushing 100 percent right now," he said. "With ligaments, you always feel you’re going to rehab in four months, but ligaments need six months, no doubt. I’m good. I’m fine. For now, I’m more excited about Anderson’s rematch."